Warner Bros. and DC's latest entry into their shared universe has arrived on home video. Arthur Curry, now dubbed Aquaman (Jason Momoa), makes his solo debut after first appearing in 2016's Batman v Superman: Dawn of Justice and later starring alongside fellow DC superheroes Superman, Batman, Wonder Woman, the Flash, and Cyborg in 2017's Justice League. 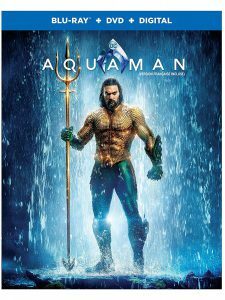 His solo adventure takes place after the events of Justice League and sees the aquatic hero embrace his heritage just as his half-brother Orm (Patrick Wilson) begins preparations for an all-out war against the surface world by uniting the remaining kingdoms of Atlantis. In order to prevent this, Arthur's mentor Vulko (Willem Dafoe) seeks out the help of Mera (Amber Heard) to aid Arthur in the search for the lost trident of King Atlan (Graham McTavish) as a means to oppose Orm's rule. Unable to go after them himself directly, Orm enlists the services of the pirate known as Black Manta (Yahya Abdul-Mateen II), who has a vendetta against Arthur, to track down and kill him. Following the disappointing release of Justice League there was a lot riding with Aquaman, DC's sole outing in 2018. For his part, James Wan stayed the course he set out on with this film. Aquaman's story is a familiar one, but in that familiarity is a strength. It's a mishmash of stories and set pieces we've seen over the years, yet Aquaman still feels like a refreshing take on them and a big reason for that is director James Wan. There's a love not just for the character, but for film itself that radiates from this movie. Whole scenes and sequences feel like love letters to films of yesteryear, all for the purpose of delivering an exhilarating experience. From its visuals and production design to the audio design and musical score, the film is a sensory buffet. The film unmistakably has Wan's imprint and marks it as much his film as it is a movie in a bigger universe. Becoming Aquaman – In this featurette we see how Jason relates to the character, having been born in Hawaii, raised in Iowa, and split between two parents. Also highlighted were his training and preparation for the role physically, and the separation he felt from being away from his wife and family. We also see how he was asked for his input on the casting of Temuera Morrison as his father Tom in the film. Lastly, castmates Patrick Wilson, Yahya Abdul-Mateen II and Amber Heard all comment on working with Jason for the film. Going Deep into the World of Aquaman – James Wan, the cast, and production crew discuss designing the world of Aquaman, from sets and costuming to filming locations. The difficulties with filming in water and adapting the studio filming to give the impression of being visually underwater are discussed, as well as Wan’s desire to film with as much practicality as possible. Highlights in this segment include the submarine set, the bar set in Amnesty Bay, the sunken Galleon, the Sicilian town, and Tom’s lighthouse. The featurette also takes a look at the difficulties in designing Aquaman’s costume in maintaining its flexibility for Momoa’s performance, while keeping its metallic look from the paint despite all the water it would endure. James Wan: World Builder – Featurette about James Wan’s task at creating DC’s most ambitious film yet. How he pulled from classic mythology surrounding the legend of Atlantis, while adding a new twist to it. Wan worked hand-in-hand with his artists and lead designers in helping shape the aesthetic look of Atlanteans. Wan and the visual effects team also speak on the difficulties of the film’s visual effects, highlighting the issue of hair as a visual cue for audiences to understand that characters were underwater. The Dark Depths of Black Manta – Featurette focusing on the character’s iconic arch-nemesis. Star Yahya Abdul-Mateen II speaks on his research into the character and what makes Black Manta an interesting villain, his origins and how it has been modernized for the film, as well as the technology under his belt before and after his Atlantean upgrade. Abdul-Mateen II goes into detail about the suit his character dons and its capabilities in the film, as well as all the work that went into it off-screen. Heroines of Atlantis – Featurette that dives into the female characters of the film: Mera and Atlanna played by Amber Heard and Nicole Kidman respectively. Wan, Heard and Kidman speak on the two roles of the film and the thought process into their casting decisions. Wan specifically speaks of his desire to cast Kidman as Atlanna, and her mutual desire to work with the director. Villainous Training – Cast members Patrick Wilson and Yahya Abdul-Mateen II speak on training to be physically capable to take on Jason Momoa as the film’s two antagonists. Wan, the actors, and stunt crew also discuss the visual differences between the two actors and how each character was approached from a combat perspective in trying to one up each other against Jason Momoa. A Match Made in Atlantis – Jason Momoa and Amber Heard discuss their working relationship in the film for this featurette. The chemistry they have both on- and off-screen and the fun and playful banter they bring out in each other. Atlantis Warfare – Featurette discussing the design of the Atlantean arsenal and the thought processes in modernizing their weapons, while maintaining classic designs befitting an ancient civilization. Wan and the visual effects artists also discuss the designs of the various underwater vehicles and how many of their designs were informed, from various sea creatures including turtles, crustaceans, and stingrays. Creating Undersea Creatures – James Wan, cast and crew discuss the various undersea creatures found in the film. Wan and the designers went with the mindset of making comic book images that would have been silly, into something modern and cool while fitting it all into the film’s aesthetic. The designs of the various kingdoms of Atlantis, including the Fisherman kingdom and the Brine kingdom and how merfolk and crabs contributed to their designs. The featurette also highlights the Trench, the monstrous creatures of the film and how James Wan’s horror origins leaned into their design. Lastly, the featurette also takes a look at the Karathen, the giant creature in the film whose design was informed by classic works like those of H.P. Lovecraft. Aqua Tech – Featurette that takes a look at the emphasis of technology in the film. The production crew speak about the use of its virtual production, which would provide a real-time pre-visualized look of the film to cast and crew as filming was going on. The featurette also looks at the production’s use of virtual reality in helping design parts of the film. Use of lighting and the technology that went into filming is also a point of emphasis in the featurette. Submarine Attack: James Wan and Jason Momoa discuss the film’s opening hero entrance for Aquaman, the thought processes in its design – from Momoa’s fighting style to the difficulties in filming in such tight areas – and how the scene sets the tone for the film and its hero. Showdown in Sicily: James Wan and crew discuss the big action set piece in Sicily and how Wan was visually designing it for a single-take sequence including camera rigging and use of second units to blend the various segments together. The Trench: James Wan and cast discuss the Trench sequence and highlight Wan’s origins as a horror director, using it to challenge himself visually as a director. Kingdoms of the Seven Seas – Dolph Lundgren narrates this featurette that takes a look at the seven kingdoms that make up the Atlantean Empire. It takes a look at how the kingdom was originally portrayed in the comics and how it has been modernized in recent times. The featurette further breaks down the various kingdoms portrayed in the film and how each differs from another from a philosophical and political standpoint. Shazam! Sneak Peek – Four-minute sneak peek of an early scene of DC’s upcoming film Shazam! In it, Shazam (Zachary Levi) turns to his foster brother Freddie Freeman (Jack Dylan Glazer) about his newfound powers as they try to work out some of his new abilities. You can find our full review on the film from its theatrical release here. If you have seen Aquaman and would like to rate/review it yourself, click here.